SolidWorks, Inventor and Solid Edge are just some examples of legacy 3D CAD solutions supported by Alibre Translate - a feature available with Alibre Design Expert at no additional cost. For those not familiar with Alibre, Alibre is an easy-to-use low cost parametric 3D CAD system mainly for mechanical engineering design of parts, assemblies, sheet metal and more. Alibre Translate (Now free with Alibre Design Expert) not only offers direct Solidworks file import of .sldprt and Solidworks .sldasm assemblies, but also Autodesk Inventor .ipt and .iam files, Solid Edge files and much more. SolidWorks users should have little trouble understanding Alibre's straight-forward solid modelling and assembly design interfaces. feature sketch, extrusion, subtraction, shelling, draft, lofting are all functions also supported in Alibre Design. Alibre Design Expert adds non-parametric (direct) editing techniques commonly found in systems costing several times more than Alibre Design Expert (less than AUD $1500 in Australia - see prices here). Expert also includes Keyshot photo-rendering and Moi 3D surfacing software at no additional cost. Alibre also offers fully integrated CNC software for 2.5-axis, 3 4 and 5-axis milling machines. Alibre CAM basic comes free with Alibre Design Expert, offering as the name indicates basic 2.5-axis milling from within the Alibre interface. A full comparison of Alibre CAM options are shown HERE. Solidworks users can also import their SolidWorks model into Alibre CAM for manufacturing. 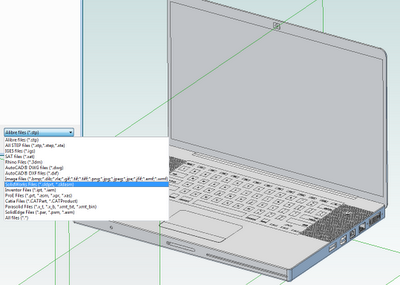 Alibre Design is an easy, inexpensive and intuitive option for SolidWorks users. Although Alibre 2D detailing and drafting environment is quite comprehensive, Alibre also integrates well with advanced 2D CAD drafting solutions like Autodesk AutoCAD or progeCAD, a low-cost AutoCAD clone. A free 30-day trial of Alibre Design can be requested directly from CADDIT Australia by following the links and downloading HERE.